08 Feb 2017 --- Algae are among the Earth’s oldest life forms. They already "invented” photosynthesis around three billion years ago and are now still responsible for the fact that every second oxygen molecule in our breathing air comes from an alga. So far, only about 30,000 to 40,000 different species of algae are known to science. Biologists estimate that ten times as many species of algae are still unknown. According to the study “How Will Germany Eat in 2030?” by the Swiss groceries concern Nestle, the fact that algae can be resource-efficiently cultivated is in itself enough to ensure that they will become a firm part of our diets. 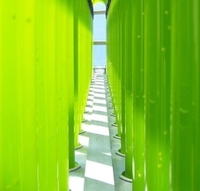 In a photobioreactor system consisting of five hundred kilometres of glass tubing, a company in Saxony-Anhalt is producing microalgae for the groceries market, and the animal feed and cosmetics industries. In the Northwest of Saxony-Anhalt, not far from the little town of Klötze in Altmark, the company Roquette Klötze GmbH & Co. KG is fulfilling customer’s wishes from Europe, Asia and America. Microalgae (microscopically small algae), in the form of so-called phytoplankton, are at the beginning of the food chains. Previously, their direct use by human beings led something of a shadowy existence. This did not change until the last turn of the millennium. “And our production site in the north of Saxony-Anhalt has a major role in these changes”, says qualified biologist Jörg Ullmann, Managing Director of Roquette in Klötze. Microalgae grow 10 to 30 times more quickly than land plants. They turn carbon-dioxide into oxygen more efficiently than most grasses and trees. Merseburg chemist Professor Dr. Karl-Hermann Steinberg put this characteristic to use in the 90s, as Research Director of the former chemistry company Preussag AG, to find a technical solution for the problem of man-made climate change due to rising carbon dioxide emissions. Back then the concept arose of an enclosed light-permeable tube system through which microalgae flow in water. In this, sunlight and CO2 allow photosynthesis, the build-up of biomass and ultimately also carbon dioxide storage. Such photobioreactors cannot, however, neutralise the large quantities of CO2 emissions of coal-fired power stations. When Preussag AG changed its field of activity at the end of the 1990s, Professor Steinberg acquired the licenses to the technology. It was his idea to use the microalgae, thriving so splendidly in the photobioreactors, for a different purpose – especially for the manufacturing of high-quality products. 17 years ago, the world’s biggest closed microalgae production plant until then was created in the Altmark with the support of the region of Saxony-Anhalt. In a 500 km-long glass tube system on an area of 1.2 hectares, microalgae can flourish protected from impurities from the environment and produce between 30 and 50 tons of biomass annually. The bioproducts that can be made from this appeared to be commercially lucrative. Compared to the competitors from Asia and America, already established on the international markets, which have so far been producing algae products in open facilities – ponds, for example – microalgae cultivation in a closed tube system has two essential advantages: firstly, biological and chemical impurities from outside – such as those due to insects, air pollutants or toxin-forming blue algae – can be excluded. Secondly, the algae can thrive much better, because they are optimally supplied with sunlight all around. There are no dark places, such as at the bottom of the pond, for example. Nevertheless, the high expectations of the then operator company Ökologische Produkte Altmark GmbH were initially unfulfilled. The reasons: on the traditional markets for products from microalgae – in Asia and the USA – the “newcomer from Saxony-Anhalt” was still too little known, and in Germany there was initially great reluctance to buy microalgae products. “In a way, the whole concept was in many respects ahead of its time and the business plan at that time was simply too ambitious”, points out Ullmann. In the long term, good ideas prevail after all. After the insolvency of the operator company, Professor Steinberg managed to find new investors and to put the plant back into operation in 2004. Since February 2008, the microalgae producer from Klötze has been a one-hundred-percent subsidiary of the French family company Roquette Fréres. The product portfolio has been substantially expanded, new processes and technologies developed and new company collaborations and customers in Europe, America and Asia sought. “We are no longer just producing products from Chlorella vulgaris, but from up to 14 different microalgae species”, says Managing Director Ullmann. “We want to cater closely to customer wishes with our products”, he adds. Products from microalgae are of interest on many markets. “As well as the nutritional supplements, which we market under our own brand “Algomed”, these include products for customers that sell them under their own label”, says Managing Director Ullmann. The newer lifestyle products produced with microalgae from Saxony-Anhalt include e.g. the soft drink Helga. In 2015 it received the “Taste 15 Award” at the Anuga in Cologne – the world’s biggest groceries fair.